The United Methodist Hymnal, No. 130. 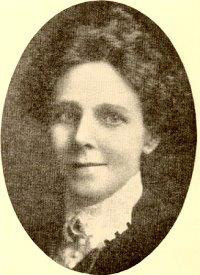 Civilla Durfee Martin (1866-1948) was born in Nova Scotia and died in Atlanta, Georgia. Martin was the daughter of James N. and Irene Harding Holden. She was a schoolteacher with a modest musical training. She and her husband, Walter Stillman Martin (1862-1935), often wrote gospel songs for revival meetings. “God Will Take Care of You” is an example of their collaboration. Walter Stillman Martin (1862-1935) was a Baptist minister who received his education at Harvard. He later became a member of the Disciples of Christ, teaching at Atlantic Christian College (Now Barton College) in Wilson, North Carolina, and, before moving to Atlanta in 1919, a location that became the base for revivals that he held throughout the United States. Civilla Martin also penned the text of “His Eye Is On the Sparrow” (1905), set to music by the well-known gospel song composer Charles Gabriel (1856-1932), and made famous by Ethel Waters (1896-1977) in the play “The Member of the Wedding” (see https://www.youtube.com/watch?v=TsTVF-uc1u4) and later as a part of the Billy Graham Crusades (https://www.youtube.com/watch?v=KAmSTWcja0M). Another hymn by the Martins, “The Blood Will Never Lose Its Power” (1912), seems to have inspired Andraé Crouch (1942-2015) and his composition by the same name in 1962. That songbook appears to have been Songs of Redemption and Praise (1905), compiled by Walter Martin and the President of the school, John Davis. Though the hymns by Fanny Crosby and Frances Havergal may have been familiar to Civilla Martin’s, her composition is distinct. All of them may have been inspired by a common passage of Scripture, I Peter 5:7: “Casting all your care upon him; for he careth for you” (KJV) . Furthermore, writers of gospel song texts often borrowed phrases from one another as starting points for their own work. Like so many songs from this genre, the key phrase “God will take care of you” and its variant, “He will take care of you,” are sung often. In this case, if you sang all four stanzas and the refrain, you would sing the title twenty times!